I have never seen another Hazel Bryan Massery autograph. 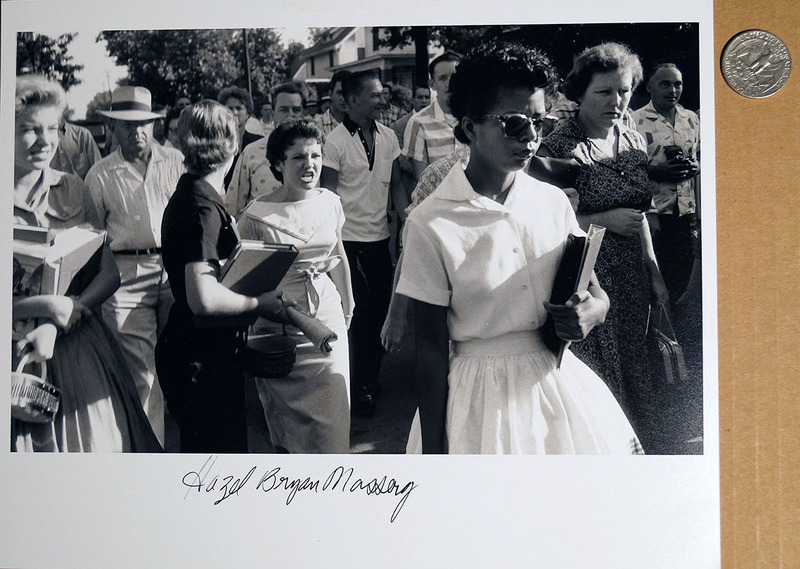 Massery was the infamous white teenager captured on the front page of newspapers around the world (click here to see original front page newspaper offered in this collection) on September 04, 1957 when she verbally assaulted Elizabeth Eckford, an African-American, who was trying to enter Central High School (an all-white school) in Little Rock, Arkansas. On September 4, 1957, Eckford and eight other African American students (known as the Little Rock Nine) made an unsuccessful attempt to enter Little Rock Central High School, which had been segregated. An angry mob of about 400 surrounded the school that day, with the complicity of the National Guard. Fifteen-year-old Eckford tried to enter the school, while soldiers of the National Guard, under orders from Arkansas Governor Faubus, stepped in her way to prevent her from entering. Eventually, she gave up and tried to flee to a bus stop through the mob of segregationists who surrounded and threatened to lynch her. Once Eckford got to the bus stop, she couldn’t stop crying. A reporter, Benjamin Fine, having in mind his own 15-year-old daughter, sat down next to Eckford. He tried to comfort her and told her, “don’t let them see you cry.” Soon, she was also protected by a white woman named Grace Lorch who escorted her onto a city bus. The plan was to have the nine children arrive together, but when the meeting place was changed the night before, the Eckford family’s lack of a telephone left Elizabeth uninformed of the change. Instructions were given by Daisy Bates, a strong activist for desegregation, for the nine students to wait for her so that they could all walk together to the rear entrance of the school. This last minute change caused Elizabeth to be the first to take a different route to school, walking up to the front entrance completely alone. Even though Elizabeth Eckford would one day be known as a member of the Little Rock Nine, at this point in the school day, she was all alone, making her the first African-American student to integrate a white southern high school. The Arkansas National Guard, under orders from the governor, and an angry mob of about 400 surrounded the school and prevented them from going in. On September 23, 1957, a mob of about 1000 people surrounded the school again as the students attempted to enter. The following day, President Dwight D. Eisenhower took control of the Arkansas National Guard from the governor and sent soldiers to accompany the students to school for protection. Soldiers were deployed at the school for the entirety of the school year, although they were unable to prevent incidents of violence against the group inside, such as Eckford being thrown down a flight of stairs. One photo taken by Counts was a finalist for a 1957 Pulitzer Prize. Another photo taken of the event by Counts was chosen as the “News Picture of the Year” for 1957 by the National Press Photographers Association. All of the city’s high schools were closed the following year, so Eckford did not graduate from Central High School. However, she had taken correspondence and night courses garnering enough credits for her high school diploma. In 1958, Eckford and the rest of the Little Rock Nine were awarded the Spingarn Medal by the National Association for the Advancement of Colored People (NAACP), as was Ms. Bates.